I finally cast on the purple hat Mother Hand has requested for Christmas. I'm using Ysolda Teague's Gretel pattern, which I discovered in my library but have never knitted - I must have bought it years ago and then never cast on. The yarn is Noro Cash Iroha, which I bought from my knitting group friend Emma's stash some years ago. I think I've used all the other stuff I bought so it is high time this was made up and loved. It's a soft blend of silk, cashmere goat and wool, with a bit of nylon in there. 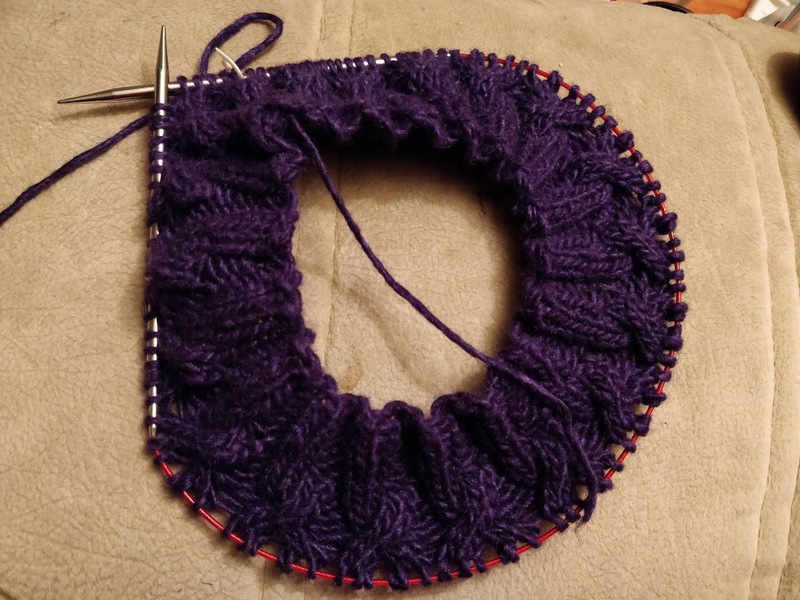 It's been quite nice to knit with so far and has a good sheen, which is good because this purple is daaaaaark and it could do with a bit of shine. Ysolda offers three options for this beret - fitted, regular and slouchy. I think I might go for fitted, purely because every time I make Mother Hand a hat she seems to try to wear it like a beanie, even though I always knit it as a beret. At least this way it might work both ways.